On Friday, America will say goodbye to Michelle Obama as first lady. Since her husband’s first term in office, Michelle Obama has led four major initiatives: Let’s Move!, a healthy living initiative; Reach Higher and Let Girls Learn, two education initiatives; and Joining Forces, her initiative with Jill Biden to help military families. She broke barriers by becoming the nation's first African-American first lady. Earlier this month, Michelle Obama reflected on her time in the White House. “Being first lady has been the greatest honor of my life, and I hope that I’ve made you proud," she said at a Reach Higher event at the White House on Jan. 6, choking back tears. Obama’s 2016 speech at the Democratic National Convention will be remembered as one of her best. “When someone is cruel or acts like a bully, you don’t stoop to their level. No, our motto is …” she started off. “When they go low, we go high," she continued, a slogan that would become the rallying cry for Democrats in the election. At a Oct. 13, 2016, campaign event for Democratic presidential nominee Hillary Clinton, Obama delivered a powerful and emotional response to Donald Trump’s comments from 2005 in which he explicitly bragged about groping women without their consent. “I can’t believe I’m saying that a candidate for president of the United States has bragged about sexually assaulting women,” she said at Southern New Hampshire University in Manchester. “I can’t stop thinking about this. It has shaken me to my core in a way that I couldn’t have predicted,” Obama said. “This wasn’t locker room banter,” she declared. Over the years, Obama made many late-night talk show appearances to promote her initiatives, and it was always memorable when she showed off her dancing chops. For the Let’s Move! campaign, she and “Tonight Show” host Jimmy Fallon dressed in cardigans, performing moves like Driving the Station Wagon and the Hip Bump. Obama and Fallon joined forces again on the fifth anniversary of Let's Move! The two rocked out, and Obama shared that “the people” are what she’ll miss most about the White House. Obama gave a personal speech about race in her commencement address at the historically black Tuskegee University on May 9, 2015. She spoke of moments in her life when she faced discrimination. “But, as potentially the first African-American first lady, I was also the focus of another set of questions and speculations, conversations sometimes rooted in the fears and misperceptions of others. Was I too loud or too angry or too emasculating?” she said. It was a speech that was applauded by admirers but also criticized by conservatives as being divisive and playing the race card. Obama has often used social media as a way to encourage healthy eating. In 2014 she head-bobbed while holding a turnip in a spoof of the DJ Snake and Lil John song “Turn Down for What.” She recreated the moment in 2016 with basketball player Steph Curry and his wife, Ayesha Curry. Obama’s legacy in the White House includes a vegetable garden. 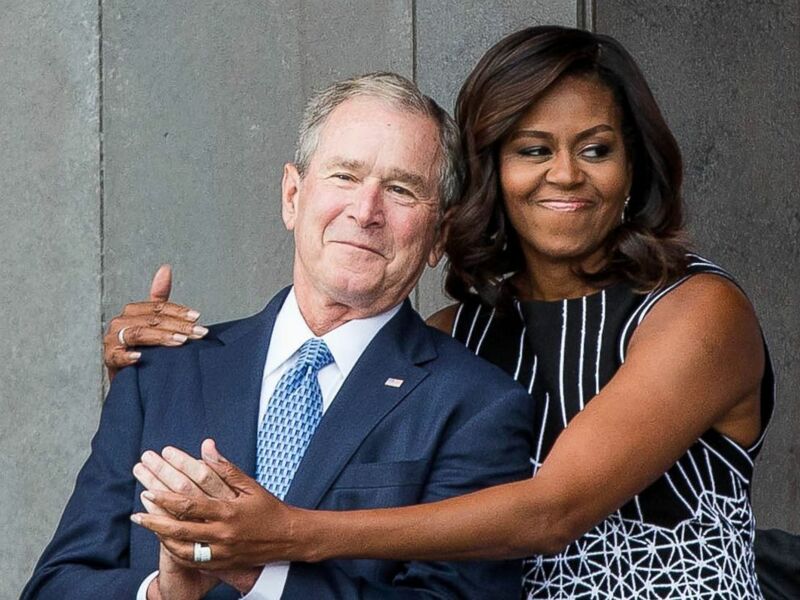 In a moment that went viral, Obama hugged former President George W. Bush at the opening of the National Museum of African American History and Culture last September. The 43rd president’s and the first lady’s hug was notable at a time when the nation was dealing with a divisive election season. The two became friends over the course of her husband’s tenure. Former President George W. Bush receives a hug from first lady Michelle Obama as they attend the opening ceremony for the Smithsonian National Museum of African American History and Culture, Sept. 24, 2016 in Washington. In April 2009, the Obamas were welcomed to Buckingham Palace before the G-20 summit. According to the British Press Association pool report detailing the meeting between the Obamas and Queen Elizabeth, Michelle Obama wrapped her hand around the queen — a big no-no in royal etiquette. When meeting her majesty, visitors should wait until the queen reaches out, and then they may touch the queen and never with a firm grasp. Elizabeth didn’t appear bothered by the gesture, as she later placed her hand around Obama. In a PSA for healthy eating as part of her Let’s Move! campaign, Obama teamed up with a few Miami Heat players. While Dwayne Wade and Ray Allen were being interviewed by their coach Erik Spoelstra, Lebron James held up a mini-hoop that Obama slam-dunked. In addition to her many accomplishments, Obama has cemented her legacy as a fashion icon. It’s hard to nail down just one memorable fashion moment from the first lady because there are so many. 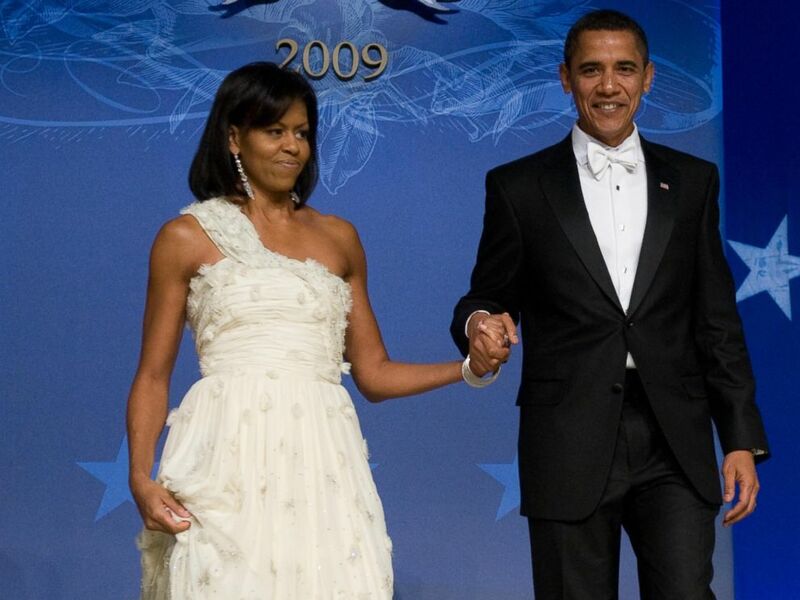 Here are just a few: a one-shoulder white chiffon gown designed by Jason Wu that she wore to her husband’s 2009 Inaugural Ball. President Barack Obama and First Lady Michelle Obama arrive at the Obama Home States Inaugural Ball at the Washington Convention Center in Washington, Jan. 20, 2009. A rose gold chain mail gown custom-designed by Donatella Versace that she donned for the Obamas’ last state dinner at the White House. 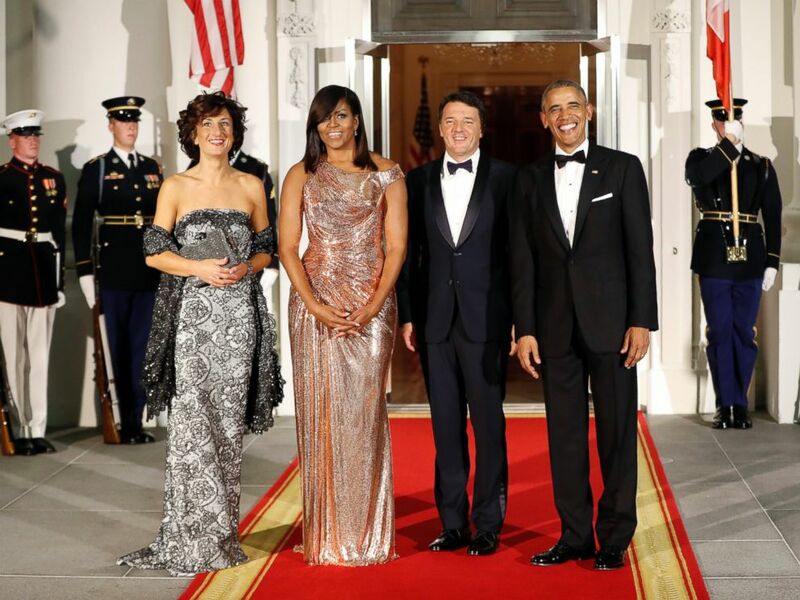 Barack Obama and Michelle Obama pose for a photo as they greet Italian Prime Minister Matteo Renzi and his wife Agnese Landini on the North Portico for a State Dinner at the White House in Washington, Oct. 18, 2016. 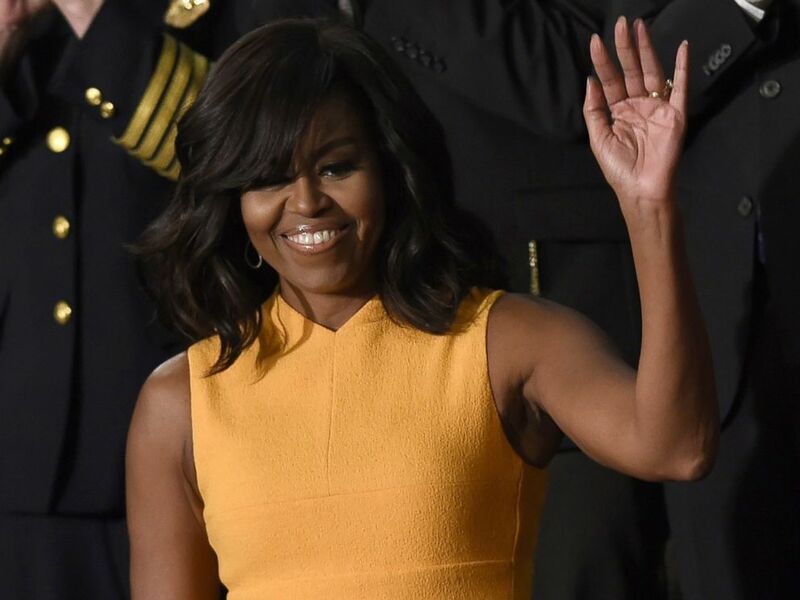 A marigold dress from American designer Narciso Rodriguez that turned heads at Barack Obama’s last State of the Union address. 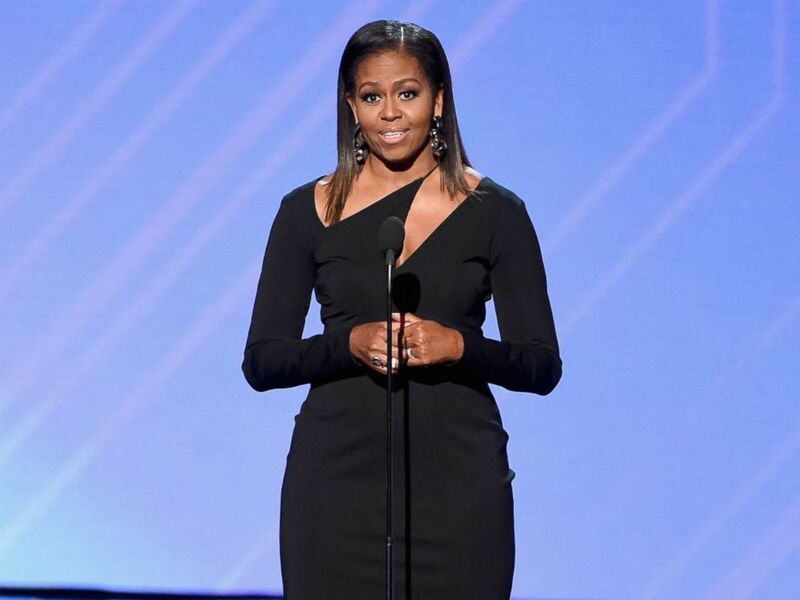 That dress sold out — as did so many others Michelle Obama wore over the years. Her fashion choices often catapulted designers from obscurity to national prominence. First Lady Michelle Obama waves before the arrival of President Barack Obama before the State of the Union Address during a Joint Session of Congress at the Capitol in Washington, Jan. 12, 2016.